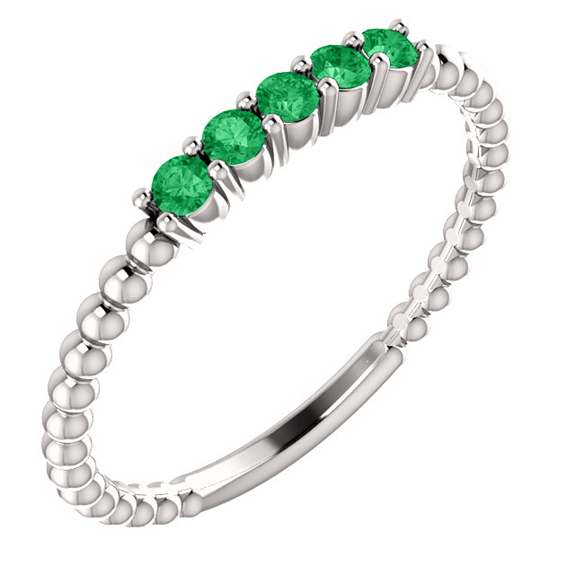 Apples of Gold Jewelry's beautiful stackable beaded emerald band ring in silver is a ring that you will simply fall in love with from the moment your eyes land on the gorgeous, authentic emeralds and the shining sterling silver band! The beaded design of the 2mm wide band, which is in stunning .925 sterling silver, features a row of five real emeralds, measuring 2mm each. The emeralds are a vibrant, vivid green and are A rated, giving this beautiful ring even higher of a quality! We guarantee our Stackable Beaded Emerald Band Ring, 14K White Gold to be high quality, authentic jewelry, as described above.